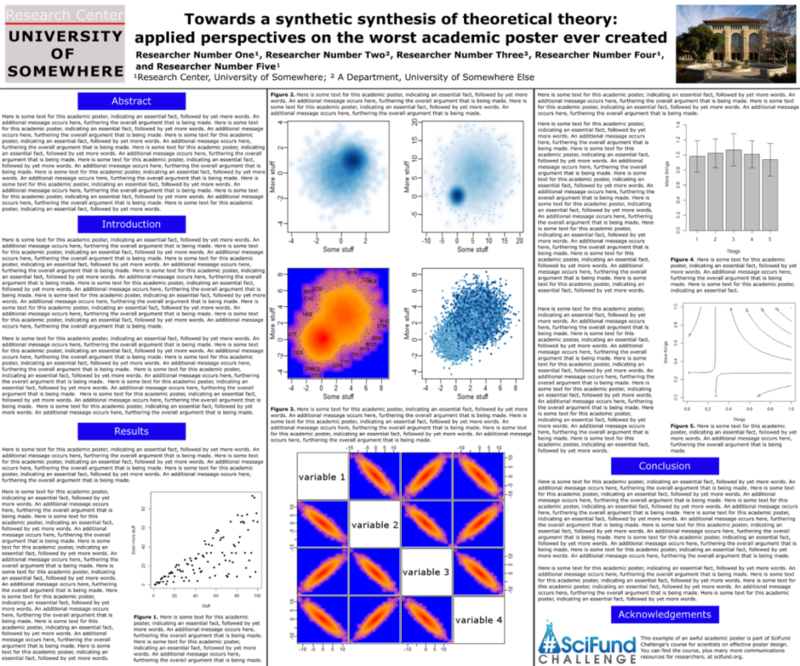 What’s the secret to a great academic poster? Less is more! What makes for a first-rate academic poster at a scientific conference? You might think an excellent poster presents a lot of information – but you would be wrong. A great academic poster is a conversation starter, with any information presented in service of drawing people in. To understand why, let’s take a step back. Why would a scientist like yourself present a poster at a conference in the first place? Maybe you are looking for a postdoc. Maybe you are looking to convince your colleagues to use a method that you have devised. The possibilities are endless, but all of them involve connecting with your colleagues. We’ve all seen posters, like the one above, which try to jam a whole paper’s worth of information in. Here’s the thing though: a paper is not a poster. In poster-land, information is only worth something if conference-goers are willing to stop and chat with the poster creator. Super-dense posters like these are much more likely to repel people. And, without those people, you can’t achieve your conference goals. A much better way to structure a poster is around a big picture idea that you want people to remember and that will get conversations started. How exactly do you do that? We happen to have tons of advice as part of our Academic Posters class. Here’s the relevant section of the class material.